Moving through the holiday season, today ChasingTreasure.com will highlight another terrific gift idea, this time for the husband of many years. This particular treasure are locking watch boxes with display windows. These make a great husband’s gift due to expense, the type of products that it protects, and usefulness to the recipient. Assuming he does not already have a watch case, here are three reasons why this is a wonderful gift idea. 1 He likely has at least 3 watches, at least one of which is very expensive. And some men have accumulated a lot more through the years, who have a watch for various activities. He’ll have a one for business casual, business professional, knock-around on the weekends, sporting events, a dive watch, and a pilot’s watch with tachymeter and stop-watch. This collection can be securely stored in a watch case that includes removable padded holders, lined interior, and lock. 2. As a gift, the high-end watch case is both thoughtful and functional. It is something that he’ll see, use, and appreciate daily. 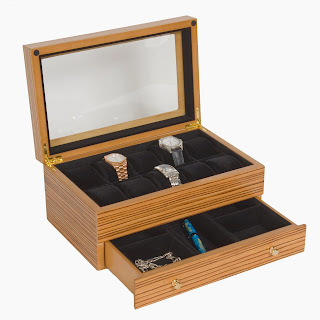 Larger watch cases can hold up to 20 watches, which can easily accommodate his & hers collection. This alone makes the watch case a practical addition to the bedroom too. All are hand-finished and come in various colors from neutral dark woods, to lighter tans, and dark black ebony to fit any décor. 3. A watch case as a luxury gift is also unique: because it reflects the higher value tastes of one who collects multiple timepieces, it is for a very distinct niche that includes those who appreciate the finer luxuries. That does not mean that the watch case itself is expensive, however. Almost all of the higher quality boxes that can hold up to 10 watches are well under $200. In discussing watch holders, we will briefly touch upon watch winders, which are for the very high-end watches: those that are automatic. This simply means that the watch does not need a battery or manual winding, as their mainsprings are wound by movement of the wearer’s arm. The watch-winder not only protects these expensive timepieces (expensive due to the craftsmanship needed) but also keeps them wound when not worn. For the wife whose husband has (almost!) it all, consider a watch case as the perfect treasure for him!